Around two hundred Members of the Burundi Parliament took part in a workshop to promote parliamentary engagement in climate change related actions in the country. 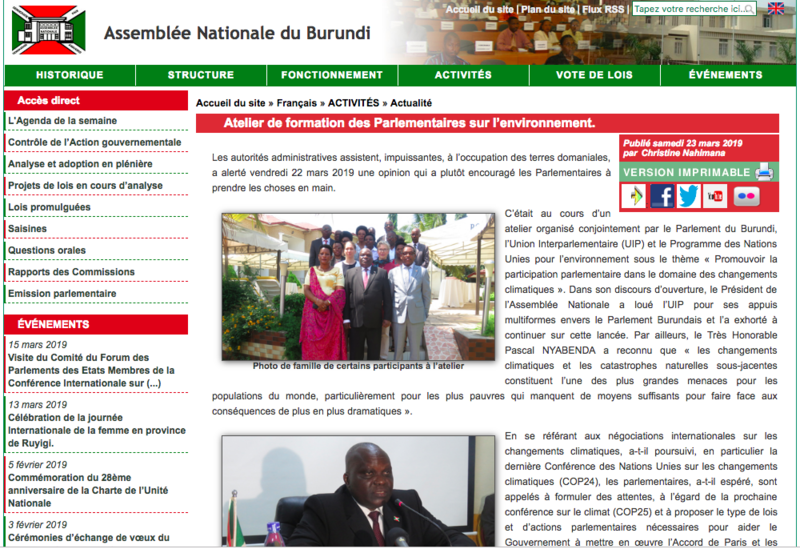 The workshop, held on 22nd March in Bujumbura, was organised by the Burundi National Assembly in conjunction with the Inter-Parliamentary Union and UN Environment. It was attended by the President of the National Assembly and the two Deputy Speakers of the Senate and National Assembly. The workshop opened with some briefing on anthropogenic climate change causes and impacts in the Burundian context. LRI gave presentations on the Paris Agreement and the rules for its implementation (the so-called Rulebook) adopted at COP24, in December 2018, and highlighted those areas where more work will need to be done this year. The next presentation focussed on the implications of the Paris Agreement and Rulebook for Burundi, with Ms. Renilde Ndayishimiye, until recently UNFCCC focal point for Burundi, introducing participants to the country’s nationally determined contribution and highlighting actions needed to fully implement the Agreement, and challenges and opportunities related to this. The meeting provided an opportunity to showcase LRI’s new climate legislation advice portal, developed in collaboration with UN Environment, as a resource tool for parliamentarians and government policy makers engaged in law review and development at domestic level. The final session in invited participants to discuss ways in which parliamentarians can further support climate action in Burundi through legislation and institutional reforms.